See also 2010, and 2011 and 2012 and 2014. Why go to University? Marco Polo Lounge, 1100-1150h: 6 January. Visiting the Amazon, Marco Polo Lounge, 1500-1550h: 9 January. Secret Weapons of WWII, Marco Polo Lounge, 1500-1550h: 11 January. Immortal Legacy of WWII, Marco Polo Lounge, 1400-1450h: 15 January. Bringing Dinsosaurs Back to Life, Marco Polo Lounge, 1100-1150h: 17 January. o	Climate change - myth or reality? o The realities of telepathy. Marco Polo Lounge, 1500-1550h: 25 January. Visiting the Caribbean, Marco Polo Lounge, 1600-1650h: 27 January. How Wolves gave rise to Humanity, Marco Polo Lounge, 1400-1450h: 29 January. Miracles the BBC won't Show You, Marco Polo Lounge, 1500-1550h: 4 February. o	Was Malthus ahead of his time? Marco Polo Lounge, 1100-1150h: 6 February. o	Is the love of wildlife hard-wired into us all? o	Where does the water go at low tide? o	How long can the NHS continue in its present form? o	Which is the planet's most destructive animal? o	Meat - 'contamination' is often 'substitution'. o	Water - tap? Or bottled? o	Intelligent life on other planets. o	The 'crock of gold' companies use ... its origins, and what is the future? o	Creationism versus evolutionary theory. Marco Polo Lounge, 1400-1450h: 12 February. Sailing: Tilbury, London - Amsterdam, Netherlands - Lisbon, Portugal - Funchal, Madeira - Mindelo, Cape Verde Islands - Santarem, Brazil - Boca da Valeria, Amazonia, Brazil - Manaus, Amazonia, Brazil - Parantins, Amazonia, Brazil - Alta da Chao, Amazonia, Brazil - Santana (for Macapa), Amazonia, Brazil - Isle Royale, Isles du Salut, French Guiana - St George's, Grenada, Caribbean - Kinsgtown, St Vincent, Caribbean - Castries, St Lucia, Caribbean - Bridgetown, Barbados, Caribbean - Horta, Faial Island, Azores - Ponta del Garda, São Miguel, Azores - Tilbury, London. 03 January-14 February. BJF, 2013, Critical Focus column No 12: The Microscope and the Caveman, The Microscope 60 (4) 157-165, 2012. (Published February 2013). BJF, 2013, 4thought TV on cultured meat, Producer Marie Irvine, Waddell Mediam, Channel Four Television, 1955-2000h, 14 March. Allen, Rachel, 2013, Humans owe evolution to wolves says Cambridge University professor, Cambridge News, 18 March. Announcement, 2013, Brian J Ford to present An Evening with Brian, Inter/Micro conference, Chicago, Illinois, April. 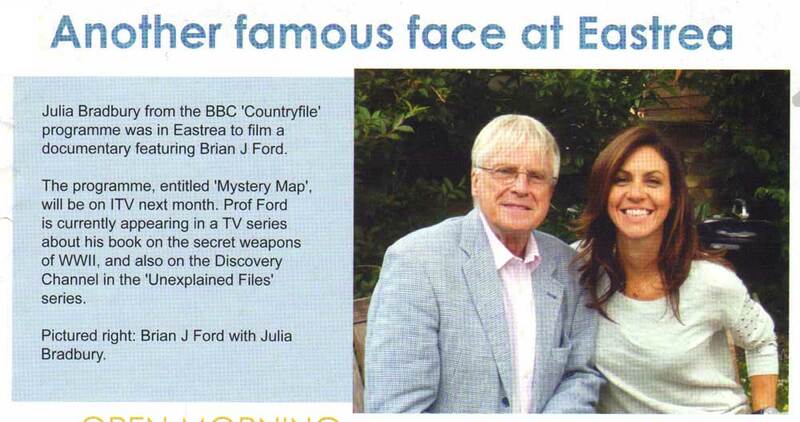 Report, 2013, Feature on TV series featuring Brian J Ford on the Secret Weapons book, Yesterday TV, from 2100h, 19 April (published by Metro on-line). BJF, 2013, An Evening with the Friends, Friends of the University Library Leaflet, Cambridge University: 4pp, 20 April. BJF, 2013, Solving the Mystery of Spontaneous Human Combustion, illustrated lecture for Microscopical Society of Southern California, Santa Monica CA, 1930-2030h, 13 May. Announcement, 2013, Brian J Ford to lecture for American Society of Trace Examiners, May 2013. BJF, 2013, The First Microscopes - What could they Truly Reveal?, illustrated lecture for Georgia Microscopical Society, Merritt College, Atlanta GA, 1930-2030h, 15 May. BJF, 2013, Solving the Mystery of Spontaneous Human Combustion, illustrated lecture for California Department of Justice, Richmond CA, 1300-1400h, 16 May. BJF, 2013, Imaging with the Early Microscopes,Gwinnett Technical College & The Georgia Microscopical Society, 1900h: 21 May. BJF, 2013, The Intelligence of Cells, invited presentation for South Eastern Microscopy Society, Greenville SC, 1200-1240h, 23 May. BJF, 2013, The first Microscopes - What could they truly reveal? invited after-dinner presentation for South Eastern Microscopy Society, Greenville SC, 1200-1240h, 23 May. BJF, 2013, The Case of the Disappearing Microscope, Laboratory News companion series Microscopy and Imaging: 9-10, June. BJF, 2013, The Unexpected Scientists, illustrated presentation to University of the third Age, Apex Lecture theatre, Bury St Edmunds, 1500-1400h, 7 June. Report, 2013, Discovery channel film in Eastrea (with colour photograph), Discovering Whittlesea magazine: 8, June. Exposing the Myth of Creationism, 1400-14330h, 15 July. Samson, Kath, 2013, Bizarre side to the second world war is published by an Eastrea author, Cambs Times online, 6 August. Report, 2013, Can Alcoholism, Diabetes, cause Spontaneous Human Combustion? First Post, 14 August. Wonder Weapons of World War II, Royal Court Theatre, 1400-1445h, 22 August (followed by book signing). Bringing Dinosaurs to Life, Royal Court Theatre, 1600-1645h, 23 August (followed by book signing). The Future of Food, Royal Court Theatre, 1100-1245h, 28 August (followed by book signing). Microbe Movie Stars, Royal Court Theatre, 1100-1145h, 23 August (followed by book signing). Did ‘time’ exist before God? Will time travel ever become reality? Is man ‘the water ape’? Does Gaza have large amounts of freshwater (while Israel relies on desalination)? Next 100 years – a new Manhattan or Apollo project. Royal Court Theatre, 1100-0050h, 23 August (followed by book signing). Sailing: Southampton, UK; Christansand, Norway; Copenhagen, Denmark; Warnemünde, Germany; Tallinn, Estonia; St Petersburg, Russia; Helsinki, Finland; Stockholm, Sweden; Southampton, UK. Walters, Guy, 2013, Can a Baby just Burst into Flames? [in] Daily Mail, 26 August. BJF, 2013, Critical Focus 14: Shining the Spotlight on Movie Microbes, The Microscope 61 (2): 63-73, August. 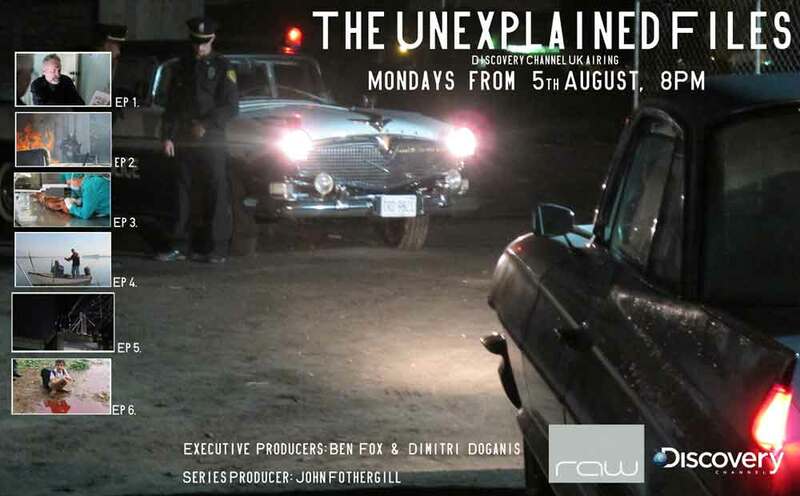 Billing, 2013, The Unexplained Files (featuring Brian J Ford on spontaneous human comnbustion), Discovery Channel TV, August. BJF, 2013, reviews The Olympic Games and the Environment by Prof John Karamichas, Biologist 60 (4): 43, September. Simon, 2013, Neurons not switches, commentary on Brian J Ford's New Scientist article, Quantum Mind website, 10 September. Report, 2013, Another Famous face at Eastrea, Discovering Whittlesea magazine, October issue. 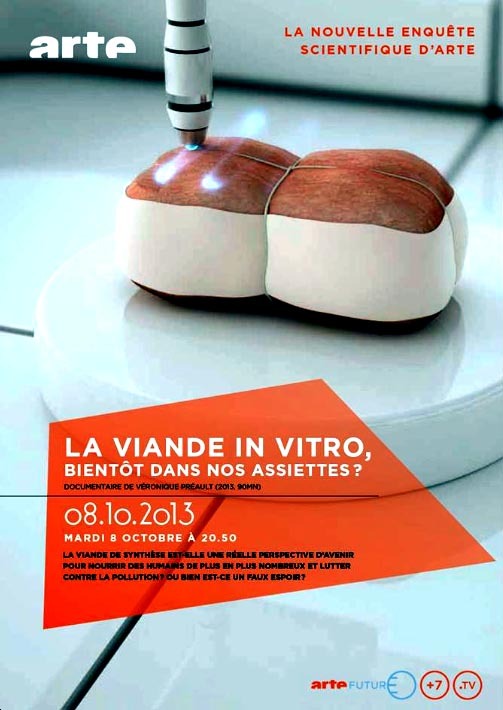 Préault, Véronique, 2013, documentary with Brian J Ford La Viande en Vitro, Arte Futur Television, France: 2050h, 8 October (online extract). World War II and Secret Science, Carousel Show Lounge 0930-0950h, 11 October. Dinosaurs Come to Life, Carousel Show Lounge 0930-0950h, 12 October. Scary Secrets of Facebook, Carousel Show Lounge 1030-1050h, 15 October. Microscopic Movie Stars, Carousel Show Lounge 0930-0950h, 14 October. Sailing Athens (Piraeus), Greece; Çanakkale, Greece; Nessebur, Bulgaria; Odessa, Ukraine; Sevastopol, Ukraine; Yalta, Ukraine; Istanbul, Turkey. Report, 2013, Spontanous human combustion theory [in] LiveScience, 2 October. 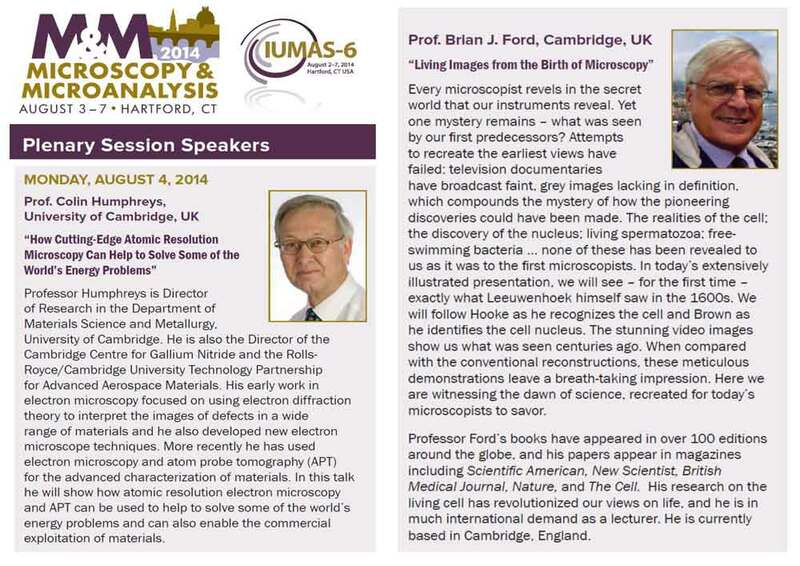 Announcement, 2013, Prof Brian J Ford to give plenary address (with Prof Sir Colin Hunmphreys FRS) at Microscopical Society of America annual meeting, Hartford, Connecticut. Today's legacy of World War II, Illuminations Theatre, 1000-1100h, 02 December. Bringing Dinosaurs to Life, Illuminations Theatre, 1100-1200h, 04 December. What your Children don't know about Facebook, Illuminations Theatre, 1000-1100h, 08 December. The Secret Language of Life (with introduction by Roy Walker) Illuminations Theatre, 1500-1600h, 09 December. Canary islands - Funchal, Madeira, Portugal - Southampton, England. 30 November - 12 December. BJF, 2013, Critical Focus 16: Brainstorm - New insights into Human Intelligence, The Microscope 61 (4): 169-179. Move to previous year, 2012, or next year, 2014.